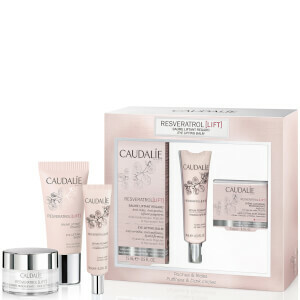 Reverse time with the Caudalie Premier Cru Eye Set; a luxurious anti-ageing trio keeps skin feeling firm, beautifully radiant and defined. Combat dark circles, puffiness and wrinkles around the eyes and provide skin with anti-ageing nourishment to reveal a more radiant and nourished complexion. The high tech, patented age-defying ingredients, used throughout the Premier Cru collection, work to tackle even the deepest of wrinkles, whilst the luxurious textures glide on effortlessly to provide a simple, yet effective skincare routine. A lightweight formula that is gentle on delicate skin. The deeply nourishing eye cream melts into skin instantly to deliver noticeable anti-ageing benefits, soothing puffiness and reducing the appearance of dark circles. Hydration is replenished to smooth and firm skin, resulting in a more youthful facial structure. Infused with soft-focus pigments, the treatment imparts a radiant, natural-looking glow that leaves eyes looking brighter, wide-awake and years younger. Suitable for sensitive eyes. Free from silicones and fragrances. An innovative formula that helps skin turn back the clock. Utilising a patented Vinergy® complex, the serum helps to smooth the appearance of wrinkles, brighten dull skin tones and firm the skin texture for a more defined facial structure. Cell activity is stimulated and radiance is restored for a smoother, more toned, visibly younger-looking complexion. An anti-ageing face lotion that transforms skin. Absorbing effortlessly into the complexion to diffuse multiple benefits, the cream helps to smooth out the appearance of wrinkles, brighten dullness and discolouration and firm the facial contours. Skin looks illuminated, redefined and noticeably healthy. Eye Cream: Apply 1-2 pumps onto the eye contour in the morning and evening, then smooth outwards. Gently massage the eyelid, paying close attention to the corner of the eye. Finish by smoothing the lip contour. Serum: Place a few drops of Serum on your fingertips. Apply morning and evening to face, neck and décolleté before your moisturiser. For more efficacy, tap gently with your fingertips. Cream: Take 1-2 pumps of the cream onto your fingertips. Apply morning and evening to face and neck. Finish with a lateral movement under the top of the neck.